I think my Instagram feed confirms that Mr. H and I are quite addicted to shopping at Catanese Classic Seafood and cooking fish at home these days. We've been enjoying some fantastic meals, and this one I wanted to share. We adapted a recipe from Fine Cooking. Line a baking sheet with tin foil and spray the foil with oil. Crush the pistachios into medium and medium-fine pieces. Combine the nuts, breadcrumbs, Parmesan, and salt and pepper in a bowl. Drizzle with olive oil and toss the combination until the crumbs are evenly moistened. Spread the mustard on top of the fish fillets. Coat the top of the fish with the crumb mixture. Set the fillets, coating side up, on the baking sheet. Bake the fillets until the topping is browned and crisp (10-12 minutes). Lightly squeeze lemon juice over the fish before serving. Mr. H and I were in Tremont on Sunday afternoon, because, hello, that weather called for some ice cream! We headed to Tremont Scoops for our first ice cream of the season, and it really hit the spot. We had found a parking spot right in front of the newly opened Tremont General Store on Professor Avenue. Of course, that meant that I just had to pop in there. The quaint store focuses on local goods, and is selling gardening supplies, products made by local vendors, and even some produce, dairy, and meats. ...and Pope's Kitchen. I'm always a fan of any business that stocks up on these household favorites. The Tremont General Store also has their own line of products, including these jams. A few produce items were available, like garlic, onions, and potatoes. Finally, there were coolers packed with local dairy items, pasta, and meats. Other items like chocolates, soaps, coffee, dog food, Dante pasta sauce, sodas, books, bird feeders, and more make this small shop well-rounded. It would be tough to make this a one-stop shop for all of your needs, but they've got some great basics, and I love their focus on highlighting local producers. For us, it's important to know where our goods are coming from, and I prefer to support local businesses. I also suggest stopping in here when you're looking to create a Cleveland-themed gift basket, which I seem to do often. I'll cross my fingers for their success, because I think it's a welcomed addition to Tremont. I've been slacking on hitting up the 2016 To Dine Challenge restaurants so far this year, but...Mr. H and I recently went out to Great Scott Tavern in Euclid for a Friday night bite. I loved the exterior of the building! The interior of the restaurant was also much nicer than I thought "tavern" in the name implied. It reminded me of Oak Barrel in Valley View. The menu is not extensive, but it covers all the bases. I think the menu is kid-friendly too. I could have made a meal from the "first course" section, easily. Instead, I convinced Mr. H to split the Joe's Cesar Salad ($8) with Grilled Raddicio and Romaine Lettuces, Anchovy, Parmesan Cheese, Red Onion, Capers, and House Caesar Dressing. This picture is just a half portion. It was a little over-dressed, but I absolutely loved the mixed grilled lettuces and the addition of capers. I'll be trying to recreate this salad at home this summer. From the cherry wood fired grill, Mr. H ordered the Grilled Lamb Chops ($28) with Two Lamb Rib Chops, Farro, Kale, and Roasted Root Vegetables. The lamb was a little overcooked for his personal taste, but it was still tender and not too dry. Mr. H really enjoyed the two sides. I decided to order the Diver Scallops ($24) with five Sea Scallops, Sweet Potato Puree, Lemongrass Chutney, Frisee, and Kim Chi. The presentation was delicate, and the meal was very light. Perfect after that large portion of salad. Great Scott Tavern also had a small list of craft beers, which I appreciated. It was just what I was craving on a Friday evening after a long week of work. I'm not sure what I was expecting, but I was pleasantly surprised by this Euclid find. We did have slight issues with service, but he had a great attitude, which goes a long way. Complimentary valet parking is available in the small parking lot behind the restaurant, or there is street parking across the street. On to the next 2016 To Dine Challenge restaurant! It's no secret that I love the Greater Cleveland Food Bank, and continue to support the organization that gave me my first job in Cleveland almost nine years ago. I believe in their mission, and the staff's passion for what they do in infectious. I try to continue to give back to the organization, particularly during the annual Harvest for Hunger Campaign. Across Northeast Ohio, companies, schools, and community groups are organizing food and funds drives, shoppers are able to donate at the cash register at local grocery stores, and you can host a Virtual Drive or make a monetary donation online during the Campaign. 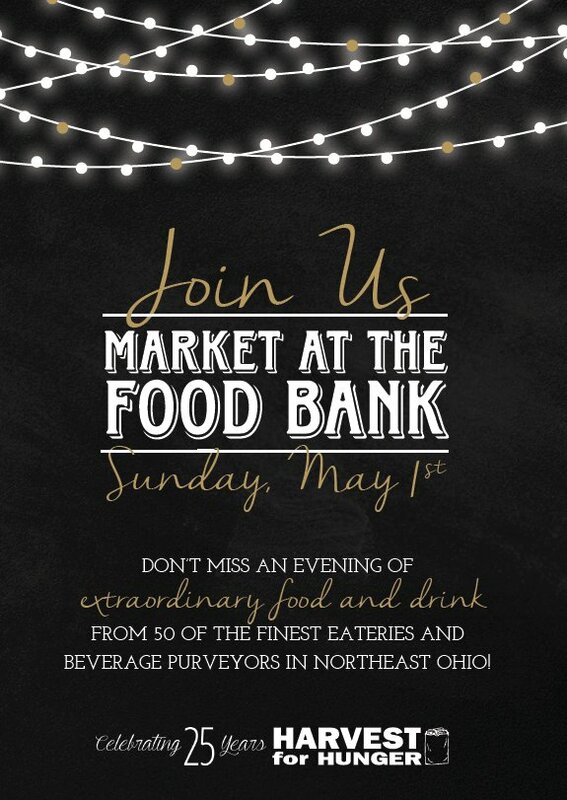 But, one of my favorite ways to support Harvest for Hunger is by attending the annual Market at the Food Bank event. 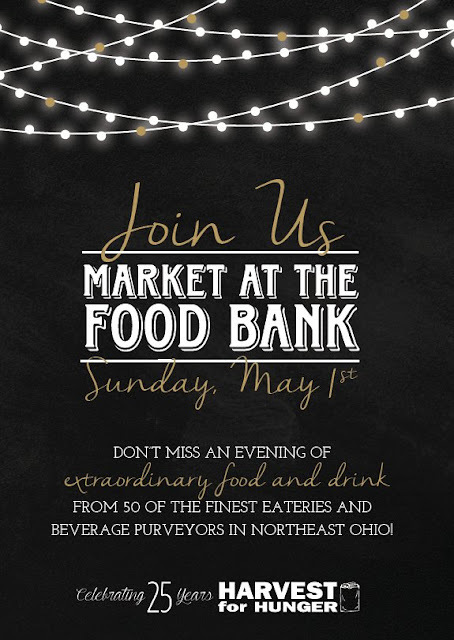 The event is being held on Sunday, May 1st at 6:00 p.m. at the Food Bank this year. Tickets are $100 for General Admission, or $200 for VIP. With food samples from restaurants like AMP 150, Bar Cento, BOMBA Tacos + Rum, Cork & Cleaver, EDWINS, Lucky's Cafe, Melt, Strip Steakhouse, and Zack Bruell Restaurants (just to name a handful)...you're sure to leave full and satisfied. Personally, I'm looking forward to sampling food from the soon-to-open The Plum Cafe & Kitchen. But the list includes 40+ restaurants and beverage purveyors. With Harvest for Hunger celebrating 25 years in 2016, the Food Bank hopes to raise more than $250,000 at the event. For every $1 donated, they can provide 4 meals in a local hunger center. The evening also includes raffles, auctions, live entertainment, and more. I have good news. One lucky reader is going to win two General Admission tickets to the 2016 Market at the Food Bank. Just use the form below to enter. Don't forget that you can tweet daily for more entries! Good luck! A random winner will be selected on Friday, April 22nd. Disclosure: I was provided with two General Admission tickets for myself and a guest, and two General Admission tickets to give away in exchange for this post. I am a former employee of the Greater Cleveland Food Bank. All opinions stated are 100% my own. I've mentioned the lady butchers of Cleveland's own Saucisson on this blog before. These chef friends started a business together based on their shared passion, and an interest in supporting local farms through their craft. It doesn't get any better than that. Since then, they've been providing artisan cured meats and sausages at farmer's markets, retail locations like The Grocery and Market at the Fig, and on restaurant menus like Cork & Cleaver, AMP 150, Porco Tiki Lounge and more. Well, it's time for these ladies to take it to the next level. They have secured a location and started a Kickstarter campaign to fund their brick-and-mortar production facility and retail butcher shop in the Slavic Village of Cleveland. In this space, you will be able to purchase pork chops, steaks, sausages, soups, stocks and their full line of charcuterie items. They will also be serving sandwiches, soups and charcuterie boards daily and keeping the space active by putting on sausage making classes, wine and beer dinners and the popular “butcher for the day” classes. Personally, I took a sausage and pasta making class with these ladies, and it was beyond fun and informative! We were all pretty impressed that Melissa and Penny were able to get us to make that! Some of us, *cough* *cough* me, are not the best in the kitchen. Mr. H and I are looking forward to having their products more readily available, and taking more classes, so we instantly backed them in their Kickstarter campaign. I think that you should too. Cleveland needs this. Please consider helping to make their dream come true. You only have until April 30th to help them reach 100% of the goal, or they won't receive the funding. Each donation level offers great prizes, like product, branded merchandise, a picnic package, meat of the month club for a year, private dinners, and more. Go check it out, and support these ladies. 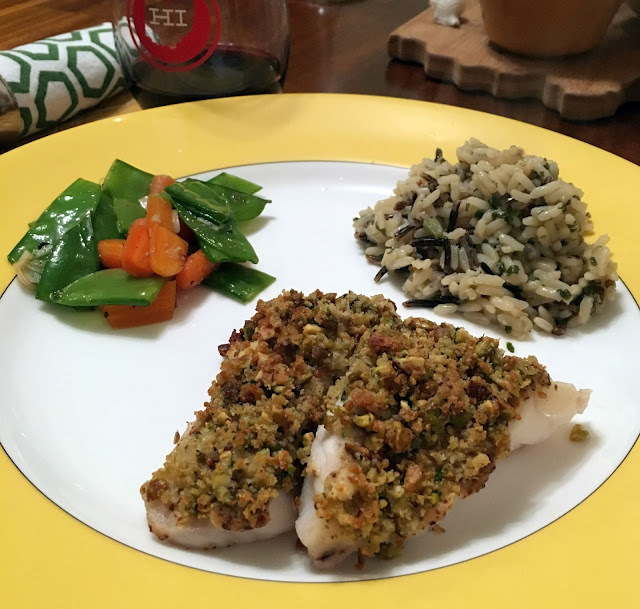 I have to share this recipe with you, because it was a quick weeknight meal that surprised us at how much we enjoyed it. It will be one that we'll make again! We adapted the recipe from Cuisine at Home. Whisk together the broth, sherry, soy sauce, peanut butter, chili garlic sauce, brown sugar, cornstarch, and sesame oil. Heat peanut oil in wok or large skillet over medium-high heat. Add ground pork or sausage and stir-fry until cooked through (5 minutes). Add in mushrooms and onions, cook through. Simmer until thickened (2-5 minutes). Serve over noodles and garnish with peanuts. We also topped ours with a couple drops of Sriracha. Last month's Cleveland Dinner Club event took the group to Eric Williams' El Carnicero in Lakewood. Just one reason why I love these monthly outings, it sometimes takes Mr. H and I to new-to-us restaurants that we've been meaning to try. ...and Happy Hour at the bar. Chef/Owner Eric Williams was on hand, but gave Chef Daniel Garcia most of the credit for our menu that evening. We started with a Smoked Tomato Soup with blue crab, sherry, jalapeno, and cilantro. I don't even typically like tomato soup, but this was shockingly good. The layers of flavor that had been developed were surprising, and I happily slurped this down. Next, we had a Cauliflower Salad with oaxacan chocolate mole, raisins, orange, and agave candied pecans. Again, cauliflower is not usually something that I gravitate towards, but this was nicely prepared with interesting seasoning and a light char. The star of the meal was the Jalisco Style Pork Shoulder for Taquitos. 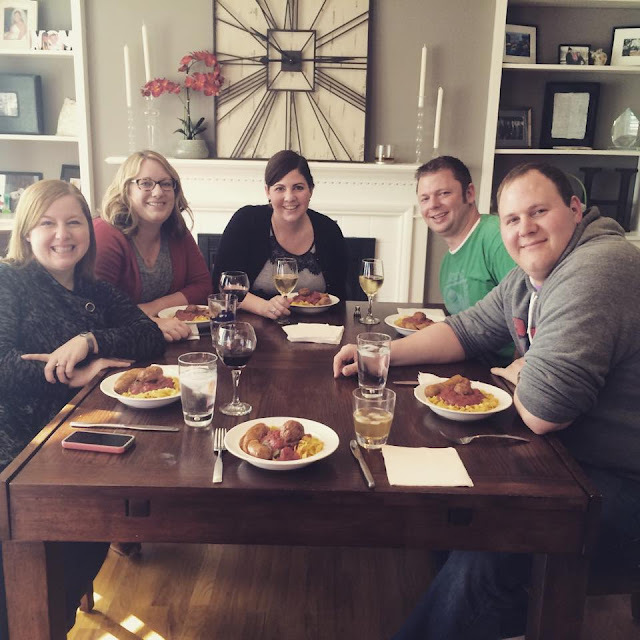 This family-style platter had us all clamoring to take pictures, and then digging in. Just like Williams' famous Momocho restaurant, these taquitos did not disappoint. For our last course, we had a Blood Orange Flan. A light, refreshing way to end the meal. All of this for $40, the standard Dinner Club fare. If you haven't joined Joe's email list for this group yet, what are you waiting for? I enjoy that we see familiar faces each month, but yet always meet interesting new people that have a common love for local, good food. El Carnicero's food will typically run you $10.50 - $17 for Tamales or Taquitos. Other menu options are available, but come for what they are known for!